On Sunday 8 February (was 22 January), an exercise is planned to test operational procedures at the Hylton Road flood defence scheme in Worcester city centre. 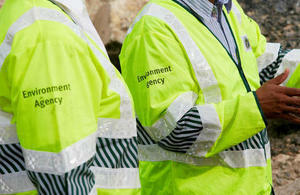 The exercise will be carried out by the Environment Agency, Severn Trent Water and Worcestershire County Council and will allow each organisation to collectively test the responsibilities that they have during a flood, such as surface water pumping arrangements and flood barrier deployment. The Environment Agency will also be carrying out essential maintenance to parts of the demountable flood barriers which are in the highway. This will mean that there will be some disruption caused during the exercise as Hylton Road will be closed to traffic between 10am to 2pm. The path by the river will remain open to pedestrians. Exercises like this are essential for us to be able to test our multi-agency procedures and ensure effective operational response, so that we are all fully prepared for when flooding does occur. We are also using the closure of Hylton Road as an opportunity to carry out essential maintenance on our flood barriers across the highway, reducing future impacts to the businesses and residents. We’ve recently increased the size of our pipework in Hylton Road so that we can use new, bigger pumps to move floodwater back into the river. This exercise is the perfect opportunity to make sure everything is working as it should and in conjunction with the actions of both the Environment Agency and the council. We’d like to apologise for any disruption, but making sure everything is ready now will help enormously the next time the river floods. We know that this closure may cause inconvenience, but it is being conducted outside of most business operating hours. It involves essential maintenance work and on-site testing to ensure we are prepared for any eventuality. 21 January 2015 Following feedback from local businesses, the Environment Agency, Severn Trent Water and Worcestershire County Council will be postponing the exercise that was planned this Thursday (22 January) to test operational procedures at the Hylton Road flood defence scheme in Worcester city centre. 16 January 2015 First published.